Adam Roynon reckons Panthers can challenge for the Premier League title. 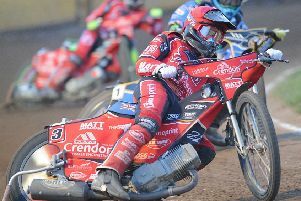 Peterborough Panthers will prove to be a match for any team in the Premier League this year. That’s the message from Adam Roynon as he gears up for a first full season in Panthers colours. The 26 year-old was drafted in during last term and did enough to earn a new deal from club chiefs Ged Rathbone and Trevor Swales after their successful mission to ensure the club survived. “I think we have the potential to be a great team,” said Roynon, who starts the campaign in a second-string berth. “It looks like there are a lot of strong sides in the Premier League this year, but we are equally as strong as any of them. “Glasgow look like they have put a good team together and Edinburgh will be tough again after doing the treble last season. “But hopefully those two Scottish teams can beat each other up and we can sneak up on them! And Roynon insists it was an easy decision to return to the Readypower Panthers’ fold during the winter despite interest from elsewhere. He admits the Showground track suits his riding style superbly and he has high hopes of improving a 4.78 starting average. Roynon added: “There was a bit of interest from a couple of my previous clubs during the winter, but Peterborough was the place where I wanted to be. “I’m feeling more ready for a new season than I’ve ever been in the past. My equipment is all sorted and I’ve been working hard in the gym to make sure I’m in the best shape I can be.